HAVE YOU SCOLDED ANY DOCTOR TILL DATE?! Most were amused with this question, some giggled, and a few others were wonderstruck?! Obviously none had scolded any customer-doctor till date, although some said they had done it out of frustration behind the back, probably because the doctor had not prescribed the promoted brand or the doctor had made demands that the field manager found impossible to fulfill. 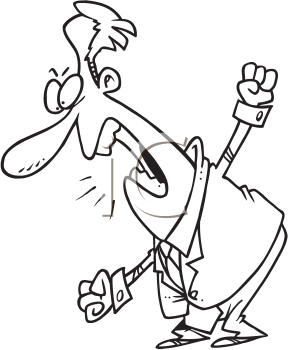 In any case, the most common phenomenon of organizational communication is scolding! It is more common than appreciating!! We see managers scolding non-managers, we observe such transactions between workers and supervisors, we see it when irate doctors or customers interact with company personnel. Although, this type of communication is very common, and has very important implications for organizational functioning, and enterprise outcomes, there is hardly any management study done on the organizational phenomenon called scolding!! During the meeting, we proceeded on to a small dialogue on the concept of scolding. By and large, most front-line managers felt scolding leaves a bitter taste - the person scolding and the person at the receiving end - do not enjoy it. Scolding will not necessarily produce outcomes as desired. It may even increase the distance between the parties. Simply put, SCOLDING IS REBUKING OR DISAPPROVING STRONGLY AND HARSHLY. In inter-personal communication, scolding has a very bad impact. People scold because of over-aggression, in their bid to be assertive people end up scolding, and this complicates the situation. Even if a subordinate does not react back, the harshness will make the person who is rebuked, have resentment. This will then lead to disharmonious relationships, difficulty in getting things done, and probably unpleasant circumstances later on. During the group discussion, on scolding as an inter-personal phenomenon in organizations, it was felt that scolding by - and - large is a negative communication and should ideally never be resorted to. However, the reality was that scolding was a common thing particularly during month ends, when sales pressures for target achievement was high!! What to substitute scolding with? If one does not want to scold, then how should it be substituted or how should the situation be managed? e) through effective training to equip the personnel with skills and right attitude like time-sense, prompt communication, timely interventions etc. This will improve level of motivation. Hence, managers will not face circumstances where scolding has to be resorted to. h) scolding can also come from physiological needs like hunger, tiredness, dehydration, etc. j) communicate with coolness, assertiveness, and rationality, indicate that there is no intention to hurt to avoid 'scolding situations'. k) scolding can be avoided by having good caring relations - this includes asking about health, enquiring about family, shaking hands, patting the back etc. Scolding is a familial, organizational and societal reality. As an organizational phenomenon it needs to be explored further. For example, the causes, implications, pros and cons of scolding should be scientifically collected and studied. Besides, the triggers of scolding, and the management of scolding too needs to be looked into. Thanks for reading this blogpost, kindly scroll down, read all other posts, click on older posts if required and please recommend this blog to your acquaintances.